According to analysts Rystad Energy, 2018 was the best year for hydrocarbon discoveries since 2015. Our Editor in Chief asks whether this, coupled with the expansion of exploration budgets, means the oil and gas industry is nearly back on track for more stabilised success. Top Hydrocarbon Discoveries of 2018. Source: Rystad Energy Cube 2018 My 2018 New Year editorial suggested that the E&P industry was moving out of the slump produced by the dramatic 2014 drop in the oil price and that better things were ahead. To a certain extent I have been proved right. 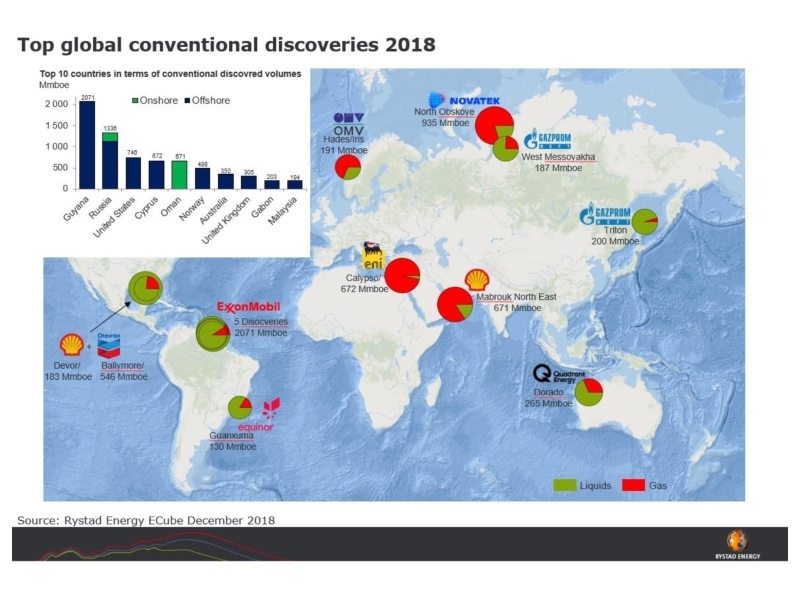 According to analysts Rystad Energy, 2018 was the best year for discoveries since 2015, with over 9 Bboe found altogether, 82% of it offshore. Exploration spending, which has dropped by more than 60% since 2014, finally stabilised in 2018. This, allied to an improved success rate, primarily due to smarter technology, has resulted in an lower discovery cost per barrel of oil equivalent, while reserves replacement has also shown improvement, rising from 11% in 2017 to 15% in 2018. The general atmosphere when talking to colleagues in the industry at the many conferences, exhibitions and seminars I attend has also turned relatively optimistic; in fact PETEX, the biennial meeting of the Petroleum Society of Great Britain, held in November, even had the title ‘A Renewed Optimism’. However, as the oil price started once again to nose dive, with Brent crude dropping from nearly US$85 in early September to just above US$50 in late December – a value last seen in the middle of 2017 – one has to ask if this optimism is justified. I think that a cautiously optimistic outlook is reasonable; reserves need to be replaced, so we need to get exploring again. According to Tom Ellacott, senior vice president at Wood Mackenzie, E&P company’s portfolios and plans for 2019 are set to weather price volatility, with a strong commitment to capital discipline. After several years of frantically streamlining their portfolios and reducing their workforces, exploration companies seem to have an appetite for exploring once more, albeit with careful constraints on costs and working with a break-even oil price scenario of around $50 a barrel. As evidence of this, recruitment has started to increase. Deidre O’Donnell, MD of specialist E&P recruiter Working Smart, reports that they are experiencing an increase in the number of new hires and consultancy roles globally. “It appears that there is a greater optimism and clients are now seriously considering increasing resources again. The demand over the last 12 months has been predominately in the digital transformation space, mainly for consultants on rolling contracts, but in recent months we have experienced a steady increase in commercial and geotechnical permanent roles and I believe that this will continue throughout 2019,” she says. Over the next few years I believe we will see a newly revitalised industry where two particular themes will be very prominent. One of these will be a strong and growing emphasis on artificial intelligence and machine learning, resulting in an even more technologically driven industry, but one which will be more streamlined and able to learn from the past. All companies, in both the E&P and the service sectors and whatever their size, will be using these technologies more and more to improve efficiencies and results, as is already evident from Deidre’s comment about recruitment in this area. The second but equally important theme for 2019, which we will see becoming more and more dominant in the industry of the future, is that of sustainability and the transition to cleaner energy sources. Hydrocarbons will be around for some time to come, but there is sense in ensuring they are used efficiently, with reduced emissions, in uses where there are limited alternatives and in conjunction with alternative energy sources. Digital transformation and sustainability; these are the future. Some recommended GEO ExPro reading relating to digital transformation and sustainability in geosciences in oil and gas. A revolution is underway in the Omani desert: renewable solar energy is being used in oil & gas to help lower the cost of production of heavy oil and conserve remaining natural resources. Technology and processes are changing rapidly, but data remains at the heart of everything we do. The world is changing, and the energy industry needs to change with it. Q&A with Max Brouwers, VP Europe, Russia and Caspian for Shell. The Middle east has been a cornerstone of the oil and gas industry for over a hundred years. Great credit must be given to the many people from both academic and organisational backgrounds who have spent many man-years – and millions of dollars – in continuing to develop these systems. It has often required new and innovative ideas, but also a lot of persistence and basic hard slog.